Rev. Steven Brockdorf is a graduate of Northwestern College in Watertown, Wisconsin. Before he entered seminary, he made two trips to Ukraine to work with Thoughts of Faith, a Lutheran mission affiliated with the Evangelical Lutheran Synod. While there he met his wife, Yulia. They were married in 1995. Rev. Brockdorf graduated from Bethany Lutheran Theological Seminary on July 20, 1999. Pastor Brockdorf served his vicarship at Reformation and afterwards served as exploratory missionary in the area of South Naples, Florida. Before studying for the ministry Steven worked as an industrial model maker in Atlanta, Georgia. He found that his career interfered with church, and that was one of the factors in his decision to begin studying for the ministry. Another factor was the encouragement he received from the congregation of Beautiful Savior in Marietta, Georgia. 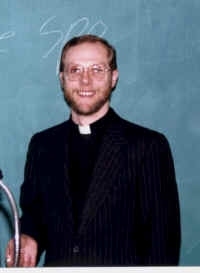 Pastor Brockdorf was ordained in November of 1999 in Naples. Pastor Brockdorf accepted a call back to Reformation in November of 2000. He and Yulia have two children, Kalyna and Kalista.